H. Rick Bamman - hbamman@shawmedia.com McHenry County College Baking and Pastry Management student Shirley Brey announces to classmates thet the fresh Biscotti is hot out of the oven as they hurry to complete fresh pastries for the grand re-opening of its student-run bakery, Sweet Scots on Monday, Sept. 14. New recipes to debut this year include a bacon breakfast quiche, two different danishes, butter cookies, and white chocolate cashew biscotti. 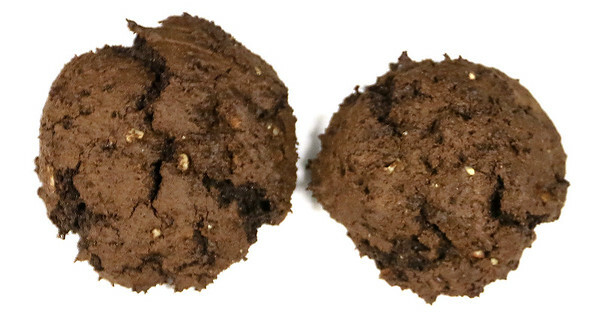 Gluten-free and vegan options are the chocolate pecan crinkle cookies and peanut butter cookies. 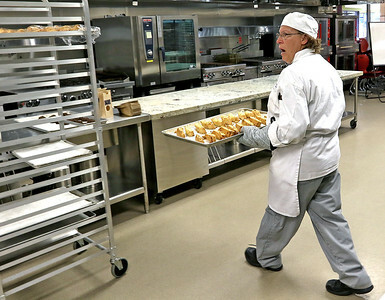 H. Rick Bamman - hbamman@shawmedia.com McHenry County College Baking and Pastry Management student Sarah Ferris sets out fresh baked pumpkin spice donuts Monday morning for the grand re-opening the student-run bakery, Sweet Scots. The campus shop in its third year, offers freshly-baked cookies, brownies, pastries and beverages and is part of the college’s Culinary Management program where students get hands-on experience running a real bakery. The shop is open 9:30 a.m. to 1 p.m. Monday and Tuesday in the Scot Room, located in the back of the cafeteria in Building B.
H. Rick Bamman - hbamman@shawmedia.com Fresh baked chcolate cookies await to be packaged for purchase at the McHenry County College Baking and Pastry Management student-run bakery, Sweet Scots. 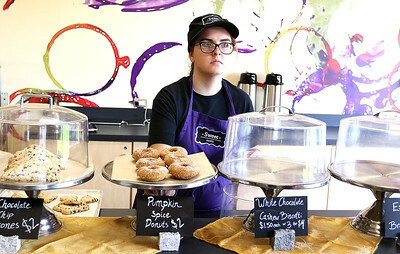 McHenry County College Baking and Pastry Management student Sarah Ferris sets out fresh baked pumpkin spice donuts Monday morning for the grand re-opening the student-run bakery, Sweet Scots. The campus shop in its third year, offers freshly-baked cookies, brownies, pastries and beverages and is part of the college’s Culinary Management program where students get hands-on experience running a real bakery. The shop is open 9:30 a.m. to 1 p.m. Monday and Tuesday in the Scot Room, located in the back of the cafeteria in Building B.